Well, I've been taking a little break, only from regularly posting in my journal though. I meant for January to be a month of organizing and updating while planning for the year... instead I've been working in the studio and settling into my winter teaching schedule. Maybe I'll do those other things in February. For possibly the first time ever I thought ahead about small, sweet gifts for Valentine's Day. This translated into snowy night bud vases and small pots with saucers with succulents or small plants in mind. In both cases- it looks like I'm subtly thinking about spring with little flowers and new growth... spring is just around the corner even though it doesn't feel like it yet in Wyoming! For the little flower pots, I stuck with a wintery theme and decorated them with white underglaze, drawing through to show off my not-so-bright-white-porcelain underneath. I drew some little succulents with ink to demonstrate how nice of a home these pots can be! The bud vases and plant pots are part of my new year refresh at Penny Lane Cooperative. I like to change up my inventory in this space regularly, while keeping lots of favorites on hand. If you haven't stopped by Penny Lane lately, put it on your list New artists in the cooperative and as always lots of cute clothing options- cuddly items for winter and a few hints of spring! 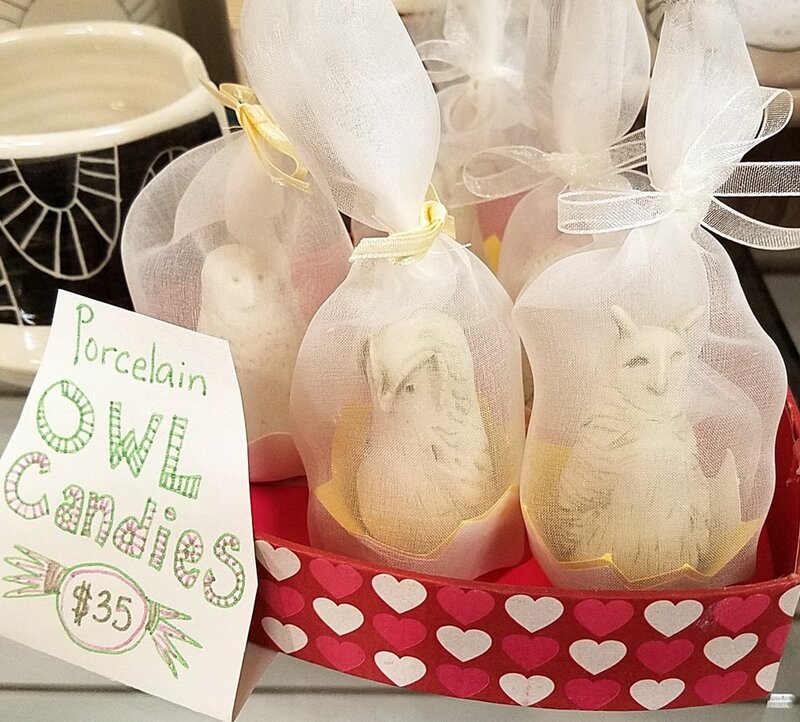 This is a great place to find a treat for your Valentine and yourself!